More power filters are sold than any other type of filter. The ease of set up and maintenance, low price, and wealth of optional features make them extremely popular. A variety of media is available, from standard carbon to specialty items such as nitrate absorbers. Like any filter, be sure to match the flow rate to the size of your aquarium. When in doubt, go the next size higher. 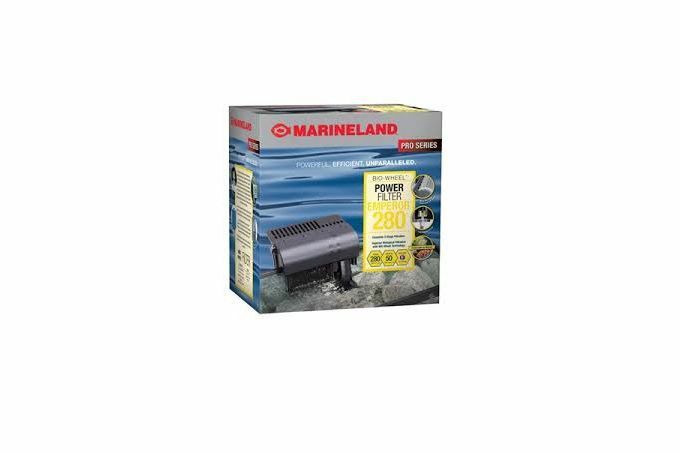 Marineland set the standard by combing biowheel technology with mechanical and chemical for the three-stage filtration, not previously available in a power filter. The media containers are large, and the unit is driven by two water pumps rather than one. A bit pricier than other brands, but definitely the top of the line in power filters. Offering the same biowheel available in the larger Emperors, the Penguin is a reasonably good filter. The negatives are a lack of flow control and an annoying tendency for them to become noisy when the water level drops. The lower price makes it worth topping off the tank more often. Hagen makes a compact, inexpensive, easy to maintain filter that sports a nice large media area. We've never had a problem with any Aqua Clear unit becoming noisy. Following even a brief power interruption, the filter will usually not restart on its own. Although a bit pricier than some brands, the design of the Tetratec makes it worth considering. While other systems can allow water to passively flow past the filter media, this unit forces the water flow through, ensuring more consistent filtration. Heating units may be added, eliminating the need for an in-the-tank heater. Whisper fits this filter well, as it runs a quietly and any power filter. On the plus side, it is inexpensive and reliable. The negatives are a lower throughput, and a tendency for the filter to become clogged much too easily.